Cologne defender Jonas Hector faces a race against time to be fit for next summer's World Cup, but Germany coach Joachim Löw can tuck into his Christmas pudding without fear of indigestion, safe in the knowledge that he has plenty of alternatives to consider. 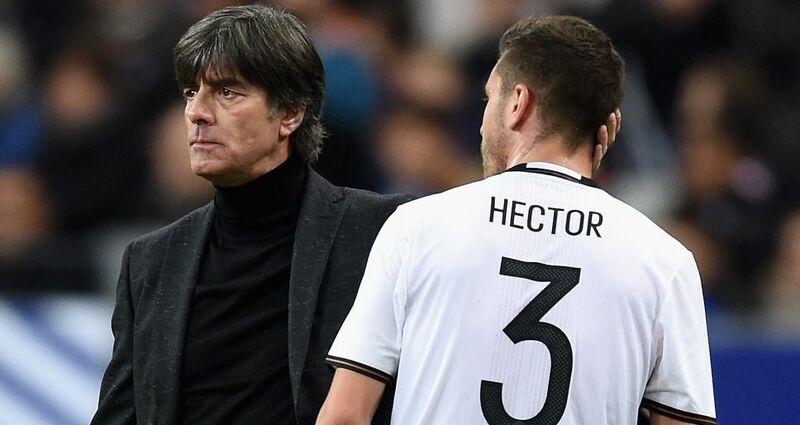 Hector, who has been Löw's first-choice left full-back since 2015, is currently sidelined with a knee ligament injury. The 27-year-old is confident of making a return in the new year, when he will try to prove his fitness in the run-up to the May cut-off for squad selections, but Löw can count on the calibre of four further full-backs, all vying for a slice of the action, and all able to provide convincing arguments to be picked. Hertha Berlin's Marvin Plattenhardt has started two of Germany's four fixtures since Hector's misfortune ruled him out, yet when Löw opted for a three-man defence, he favoured Leipzig's Marcel Halstenberg as a wing-back. Plattenhardt's no stranger to wing play either, and he knows what Löw is looking for. "I'm asked to push up as much as I can," he said of his time on international duty. "Then all I've got to do is cross the ball or shoot." Having the ball helps and there are few around who relish possession as much as ball-loving Plattenhardt. Indeed, he is not only the most frequent possessor of the ball in Hertha Berlin's team, he invariably ensures something happens as he marauds down the left. Follow Max and Plattenhardt as they go head-to-head on Matchday 15, in the Augsburg vs Hertha match centre here!